Most people dismiss valuations because of their inefficiency in dictating market turns. I understand. 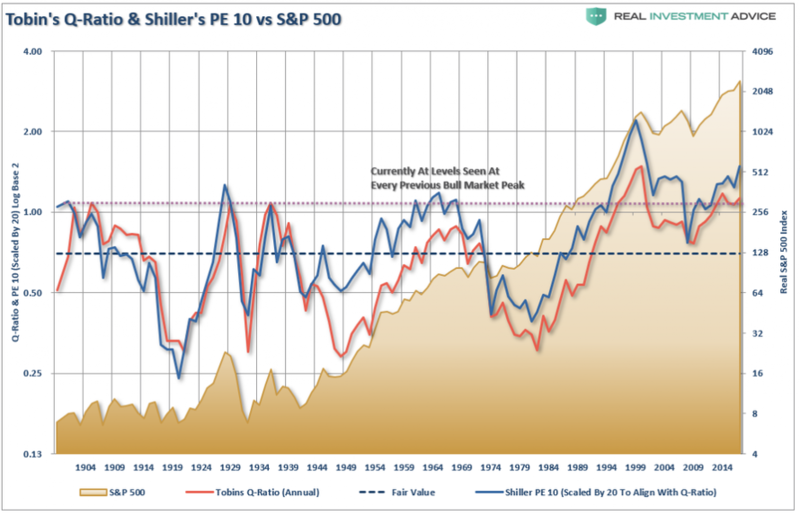 However, valuations are NOT, and have never been, a market timing indicator. They are simply a “road map” to future returns. 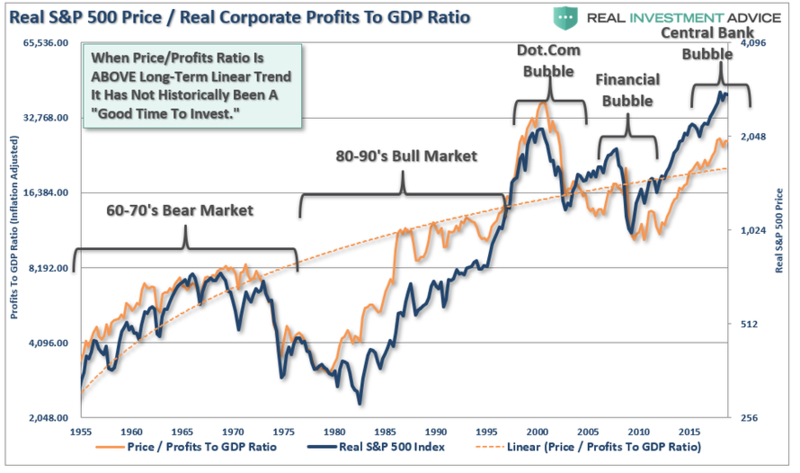 On a much shorter time-frame, a look at the price of the market as compared to corporate profits give us a better clue. 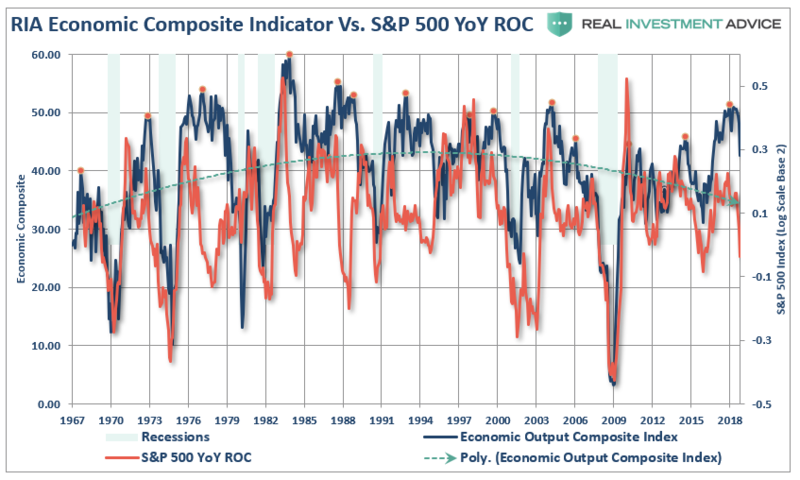 Currently, with the market is trading substantially above the level of corporate profits, any weakness in profit growth (which is heavily tied to economic growth) will foster a reversion in price. Another way to look at the excess over time is by examining the inflation-adjusted S&P 500 index as compared to real profits. Note that previous extensions of price above profits have generally not ended well when profit growth reversed. We recently proved this point by looking at the RIA Economic Composite Index as compared to the annual rate of change of the market. Not surprisingly, markets tend to perform poorly during weakening economic environments. Another way to look at the issue of profits as it relates to the market is shown below. 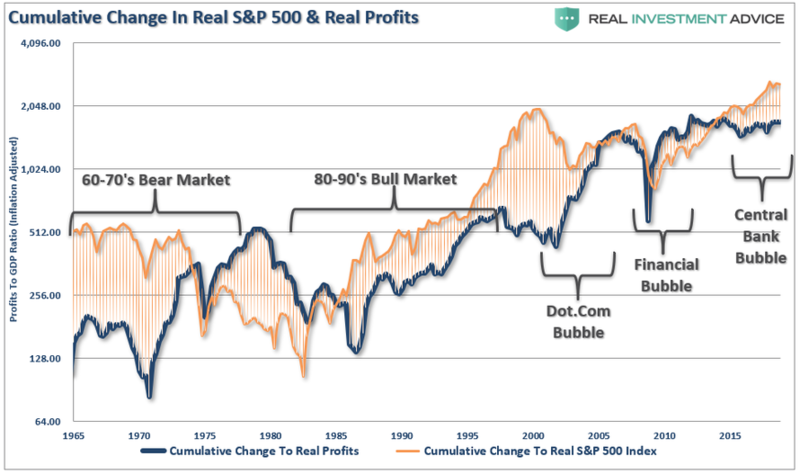 When we measure the cumulative change in the S&P 500 index as compared to the level of profits we find again that when investors pay more than $1 for a $1 worth of profits there is an eventual mean reversion. 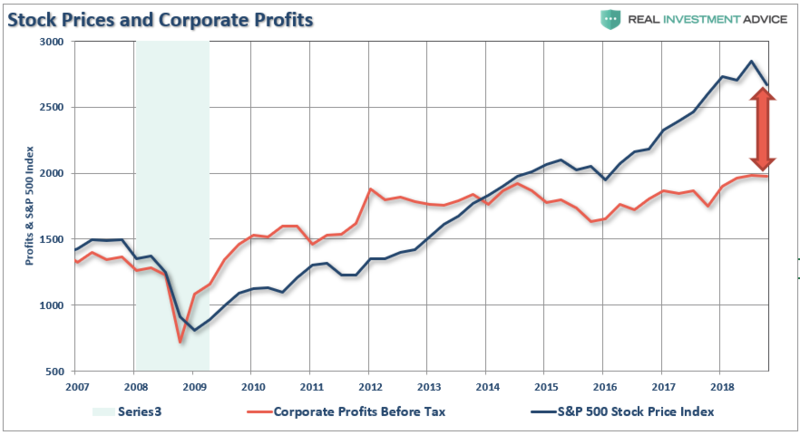 The correlation is clearer when looking at the market versus the ratio of corporate profits to GDP. (Again, since corporate profits are ultimately a function of economic growth, the correlation is not unexpected.) With investors paying more today than at any point in history, the next mean reversion will be a humbling event. Another argument made lately to support the bullish meme is that retail investors all jumped out of the market. 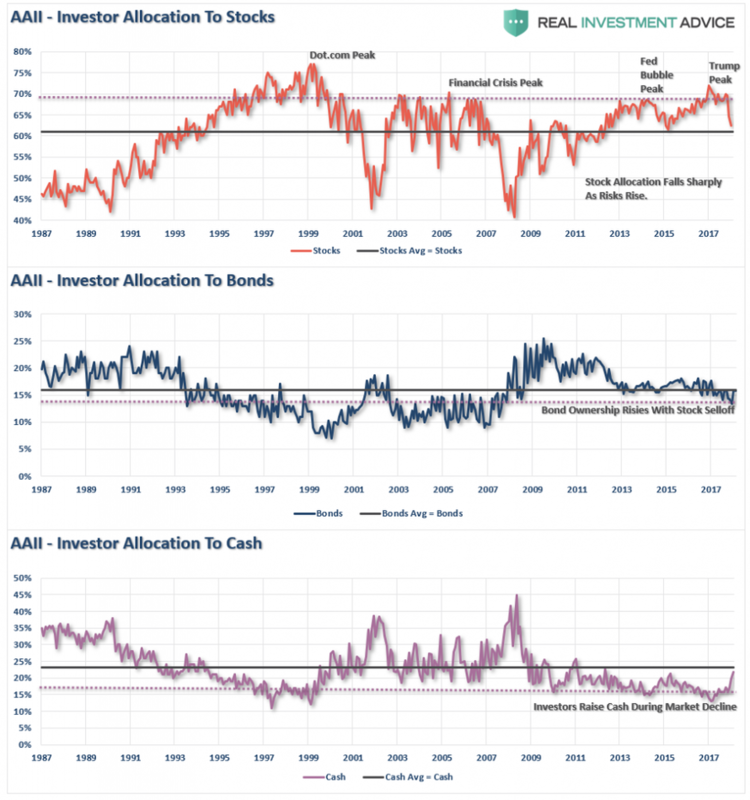 The chart below shows the percentage of stocks, bonds and cash owned by individual investors according to the American Association of Individual Investor’s survey. As you can see, equity ownership did indeed drop from the second highest level on record. However, while many are suggesting this is “bullish,” it is worth noting that historically sharp downturns have also denoted the start of bigger declines and bear markets. As we have noted previously, investors have been leveraging up portfolios to chase the market. The issue with margin debt is NOT the increasing levels of it. Rising leverage provides buying power to continue to push stocks higher. The issue of margin debt is when it reverses. Just as margin debt increases the rise of stock prices, the reverse is also true. 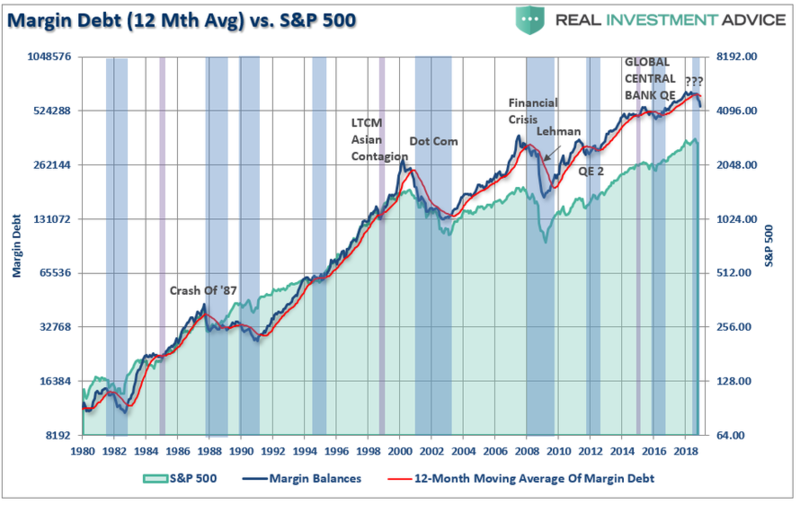 The chart below shows the history of margin debt levels versus the 12-month moving average. Over the last decade, when the 12-month moving average was violated it has previously been met with Central Bank interventions. Currently, the Fed still remains on a path of reducing accommodative policy and liquidity is being slowly drained. The decline in margin debt is an additional removal of liquidity which has previously supported higher asset prices. As a money manager, we are currently long the stock market albeit at reduced levels currently. The reality is that I must maintain exposure or potentially suffer career risk. However, my job is not only to make money for my clients, but also to preserve their gains, and investment capital, as much as possible. Profit margins will only grow and never mean revert. Yields will remain stable at low levels. Weakness in housing, autos, and other credit sensitive ares will not impact domestic growth. $1 Trillion+ deficits won’t slow the economy. Inflationary pressures will remain forever muted. Political turmoil will not roil markets or inhibit consumer confidence. The U.S. economy can remain indefinitely decoupled from the rest of world. Trade wars and tariffs are a non-event. Corporations will continue to be the predominant purchasers of U.S. stocks. The Central Bank “put” will remain in place forever. Understanding these bullish arguments is important. But more importantly is the understanding that many of these beliefs have already begun to deteriorate and are substantially increasing the risk to investors and their capital. The markets will not rise indefinitely, and the eventual mean reversion will be more destructive than most realize. Hopefully, these charts will give you some food for thought.